In my quest to keep things simple, I've decided to forego a refrigerator inside La Lair. About two years ago, I read an e-book written by Susan Gregersen, listed in Amazon's website, titled "Life Without Refrigeration". 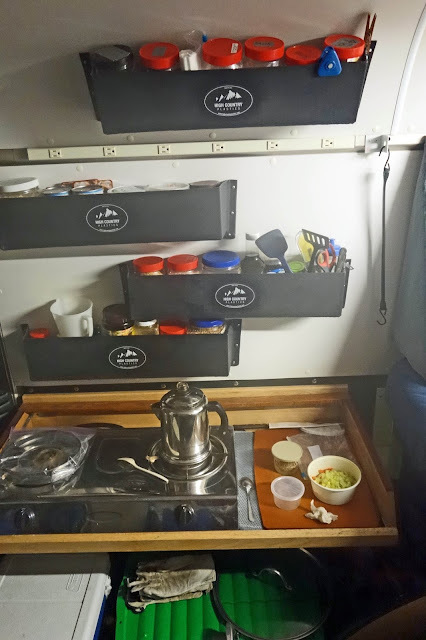 Her book wasn't written for RV folks, but I've adapted several of her tips for long-term traveling. And since preparing nutritious meals is one of my passions in life, I've decided to start a separate page called Meals W/O Refrig, passing along tips and ideas for others whether they travel or not. For example, one of my pet peeves is buying a fresh cantalope or fresh plums and it never ripens enough, no matter how long I keep the fruit. Bananas are always quick to ripen, but they get mushy real quick. Apples, however, are an exception; they're usually always very good eating. But it irked me to spend $10 on fruits only to discover later at home that it's too hard, too tart or too mushy or too brown underneath the skins, rendering them un-enjoyable to eat. And it happened frequently enough to be the rule rather than the exception. So I began buying dried fruit. It's more expensive but it's way more enjoyable to eat, either as-is or rehydrated. Plus, no worries about the dried fruit going bad if kept in a closed container. I buy dried fruit in bulk from BulkFoods.com and get a discount shipping charge of only $5 when I buy $75 worth of food items. Dried fruits are also good to pack when hiking; it won't be accidentally crushed and ooze out of a bag and it won't be heavy to carry in a pack. Making pancakes? Just rehydrate dried berries with warm water, use the wonderful juice after 10 minutes or so as the liquid portion of your pancake recipe, and throw the berries into the batter. Update June 15, 2016, just passing along a tip. I have a propane stove and bottle inside La Lair. Fairly frequently, I'll stop by a grocery store to get 6 eggs, a head of kale, and a stack of corn tortillas. All will last 3 days without refrigeration. 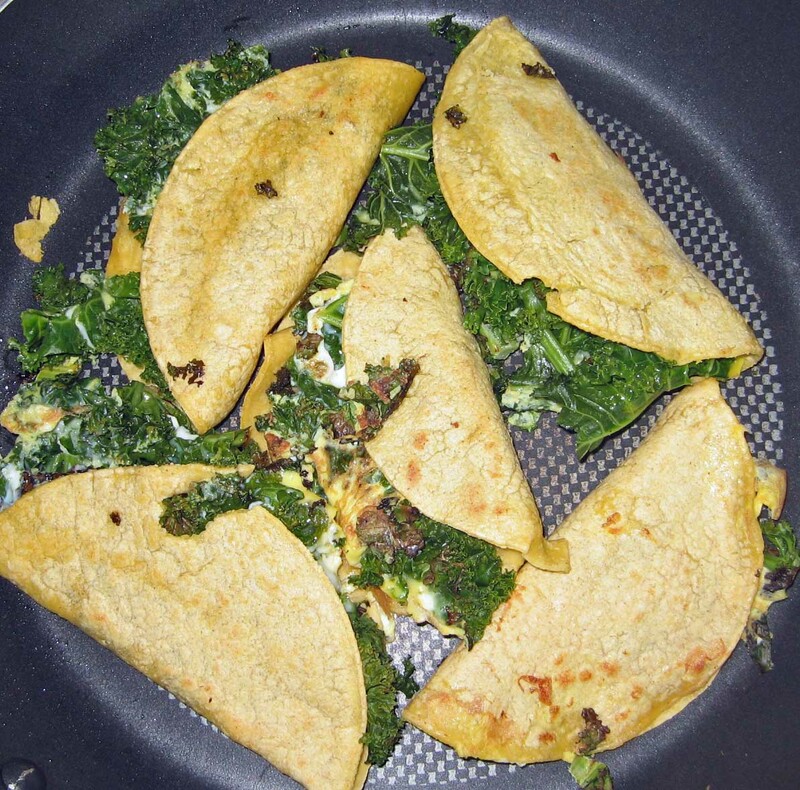 Chop and sautee some kale with olive oil on a medium hot fry pan, mix 2 eggs and pour on top of sauteed kale (add your favorite seasonings, I use cheddar cheese powder), scoot tortillas underneath when eggs are fairly cooked (about 2 minutes), fold and brown one side 1 minute, brown other side 1 minute, breakfast is served hot and quick. For a quick meal if I need the extra carbs and protein for a long bike ride, I do the same tortilla thing but smear alittle peanut butter on half the tortilla, roll and squish a bit, then brown both sides 1 minute each. Wonderful crunch and taste. 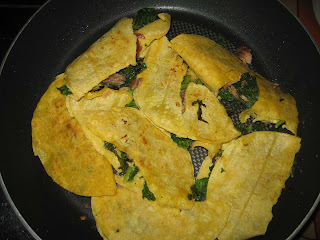 Here's another corn tortilla meal with pouched salmon bits and fresh sauteed kale. Instead of salmon, I also use pepperjack or cheddar cheese. Very good! Google "DIY backpacking meals". I use a lot of those recipes when we were out in the van. No refrigeration required and the meals can be as simple as boiling water or as elaborate as needing a backpacking oven. Just dump it all into boiling water, stir and eat! Dollar stores sell a can of chicken breast meat for $1.00 which is cheaper than any grocery store including Amazon 15 percent discounts for subscribe and save, so I stock up on these cans at dollar stores. You might try putting your un ripened fruits into a paper bag, especially with another fruit that is already ripe (or perhaps too ripe to eat). Fruits give off ethylene gas, and the paper bag allows retention of that gas without causing "suffocation" like a plastic bag would. Bananas are a particularly good source of ethylene gases, whereas other produce may not make enough on their own, so a banana in the bag is a good measure. Tomatoes work well, also. In my case, our local grocers sell beautiful, perfectly ripe, giant avocados... But they sell them at a high price. You can buy smaller, unripened (and hard as a rock) avocados for pennies, so that's what I do, combined with the ole paper bag trick. I like those DIY pouches. I have about 30 pouches of vacuum-packed Salmon flakes in La Lair. 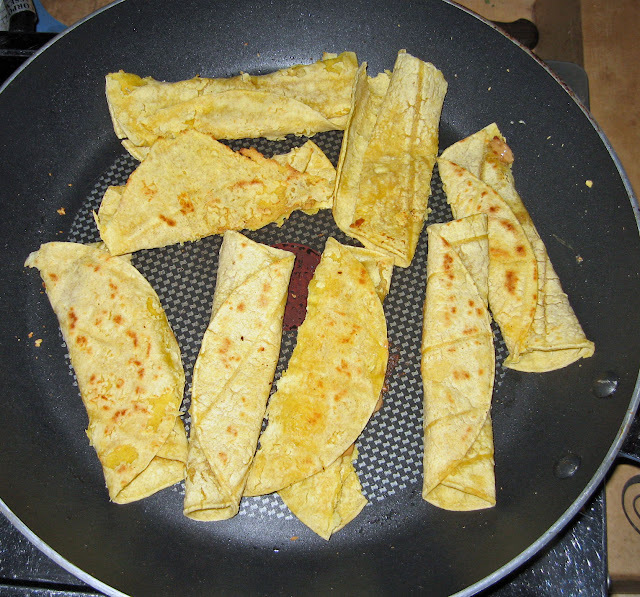 Lately, I've been buying a head of fresh cabbage and a bag of corn tortillas, they will keep a week un-refrigerated. I thin-slice/sautee a section of cabbage, mix in a pouch of Salmon, then scoot it over to the side of frying pan, put 3 corn tortillas on the bottome of pan, spoon the sauteed cabbage/Salmon on top of tortilla, fry one minute till crispy, then roll like tacos. Very good!